Thorns and knitting may not traditionally be friends, but just look at the beautiful maze of brambles that thorn stitch makes… more field of feathers than briar patch! 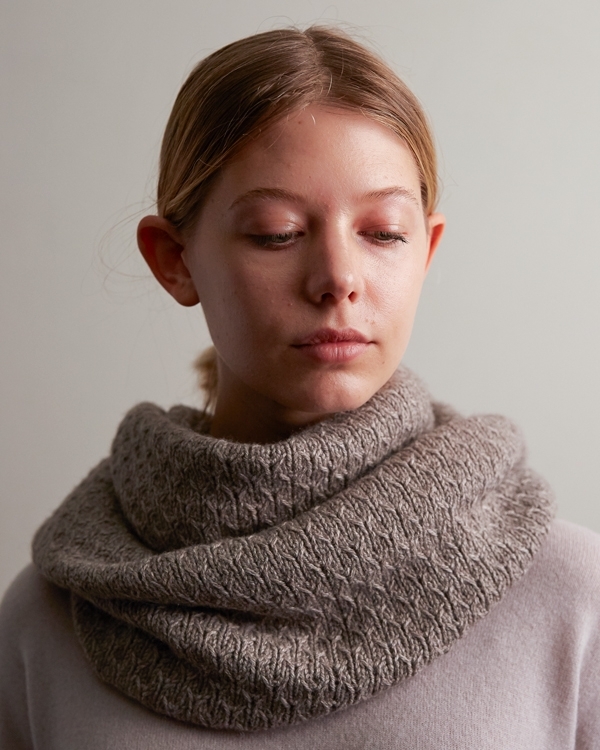 And when you double wrap this Thorn Stitch Cowl around your neck, you’ll really understand that the only sharp thing about it is the way it looks! Knit up in our brand new Understory, a blend of 50% baby alpaca, 25% baby yak, and 25% silk, the resulting fabric is decidedly lightweight, keeping you warm without weighing you down. Every color in the Understory palette is cold-weather worthy. Here, Willow Bark conjures the raw beauty of wintertime woods: spare trees, silver-y pods, and the life-giving leaf layer on the forest floor. 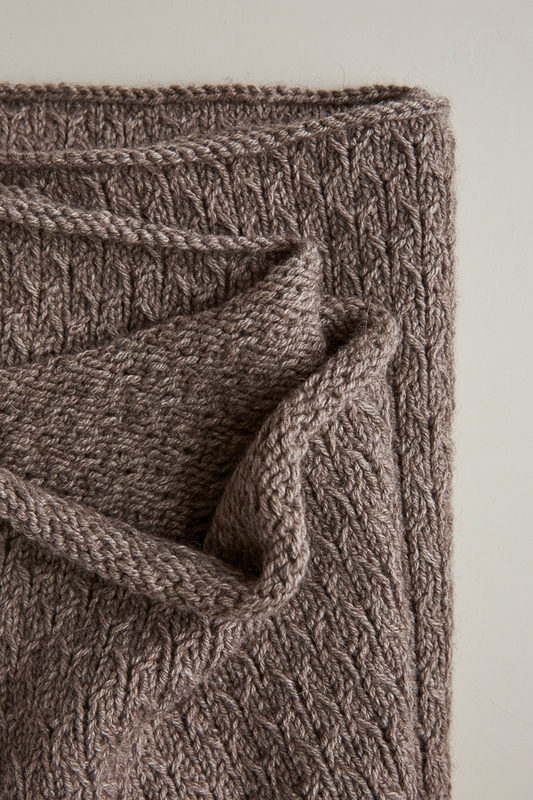 A simple 8-round stitch pattern, the Thorn Stitch Cowl is designed to interest, but not frustrate, you. It’s wonderful for getting in the rhythm, and in the end, it’s a stunner! This project designed for Purl Soho by Jamila Modeste. 4 skeins of Purl Soho’s Understory, 50% baby alpaca, 25% baby yak, and 25% silk. We used the color Willow Bark. NOTE: We used 20 grams of our fourth skein, so if you want to only buy three skeins and make your cowl an inch or two narrower, that’ll be very nice, too. Or with four skeins, know that you’ll have enough yarn to make an even wider cowl, if you want, or a little bonus hat! Slip all stitches purlwise with yarn in back, unless otherwise indicated. This stitch pattern is worked over a multiple of four stitches. Using a Long Tail Cast On, cast on 308 stitches. Round 2: *Slip 3 (see Note above), k3, repeat from * to end of round. Round 4: K2, slip 1, *k3, slip 1, repeat from * to last stitch, k1. Round 6: K2, *slip 3, k3, repeat from * to last 4 stitches, slip 3, k1. Round 8: *Slip 1, k3, repeat from * to end of round. Repeat Rounds 1-8 until piece measures 14¾ inches from cast-on edge, or until desired height. Weave in ends and gently block. Thanks for your comment! On each of our yarns we have the washing recommendations on the label. Thank you for reaching out! In our version of ssk we slip one knitwise then slip one purlwise so you will want to slip each stitch individually. I hope this helps! May I ask what is meant by “into the next stitch” means in the pattern? Thanks! Thanks for writing in! I certainly understand the confusion. I think that it is a little easier when reworded to “Into a single knit stitch [K1, yarn over (yo), k1].” You will be working the k1, yo, k1 into a single stitch. I love this Thorn Stitch pattern. Would you by any chance have a wrap pattern using this stitch? Thanks for writing us! Unfortunately, this stitch pattern is only written to be worked in the round. I will certainly pass along your idea. 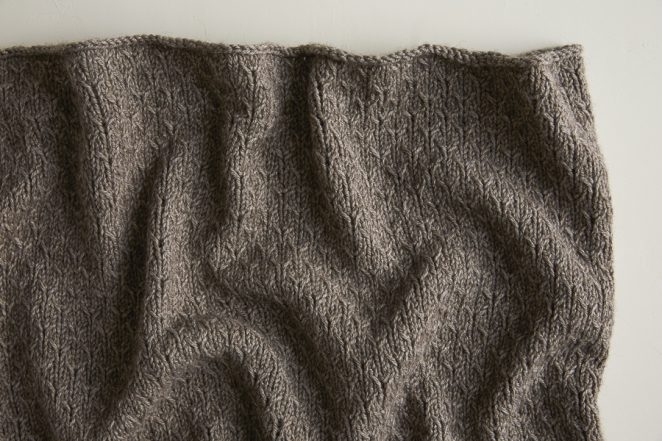 You can adopt this pattern for straight needles by purling and slipping stitches with yarn in the front in even rows 2,4,6,8 in the reverse order. 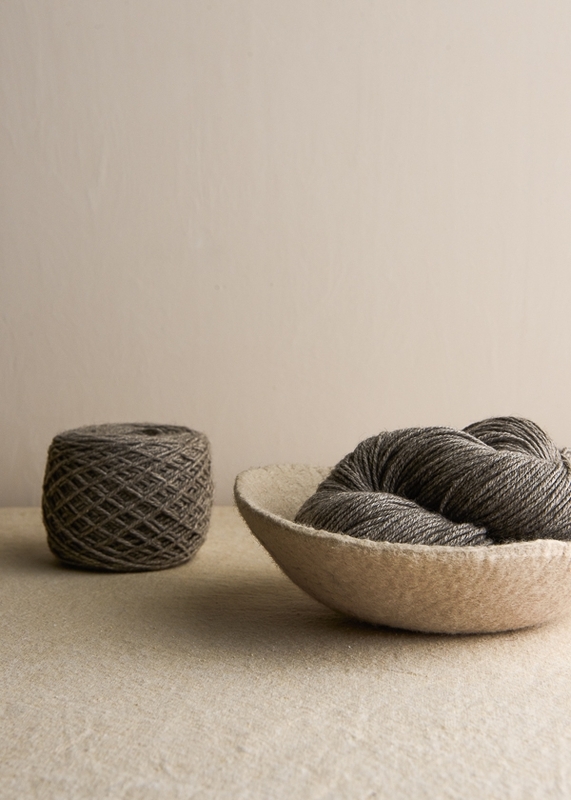 You could always knit it in the round and then steek! I hope this note finds you well and your week is a good one so far. I really like this pattern for other projects than just a cowl. Is there a charted instruction guideline for this pattern? I know, most US pattern instructions are written ones. However, for the ones among us that learned to knit in Europe, especially in Germany like myself, are more accustomed to charted instructions if they go beyond four (4) rows. Any chance you may know where this pattern can be found with charted instructions. I am an advanced knitter and would be grateful for this help. Many thanks in advance for your time and response. Thanks for writing us! Unfortunately, at the moment, this pattern is not charted. I will certainly pass along your idea! Love this pattern, can’t wait to make it. But I have one question on the pattern. What does “into the next stitch” mean in the below instruction? That makes sense – thanks so much! Is this stitch pattern a multiple of 4 stitches? I want to make a smaller cowl but don’t know how many stitches to cast on. Thanks! Yes, The pattern repeat is 4 stitches! 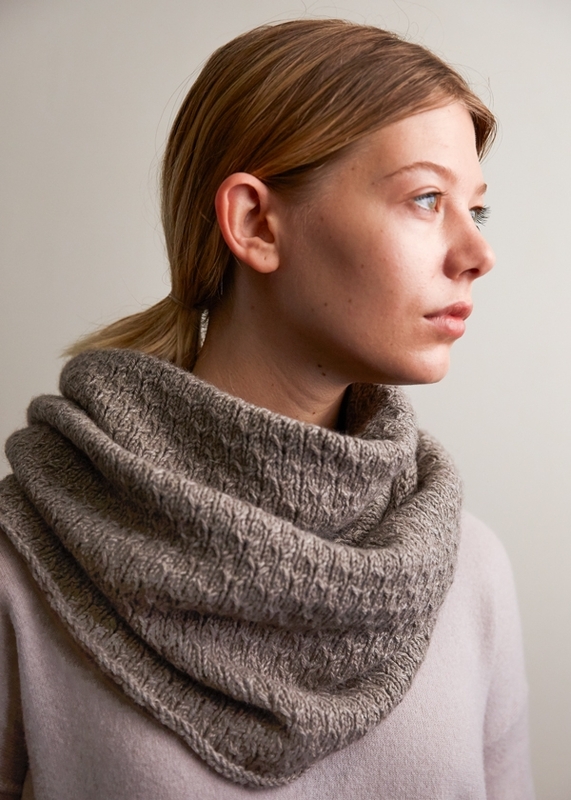 This is a beautiful cowl and the yarn looks amazing. However the first 3 stitches in round 1 and round 5 don’t make any sense to me. In round 1: first stitch are you knitting 1; yo; knitting back into the first stitch again? I don’t understand what the “into the next stitch means” (k1, yo, k1) into the next stitch. Is the next stitch the first stitch? Thanks for writing in and for your kind words! I certainly understand the confusion. I think that it is a little easier when reworded to “Into a single knit stitch [K1, yarn over (yo), k1].” You will be working the k1, yo, k1 into a single stitch. I’m also struggling to understand this instruction. Am I correct in understanding that you K1, but don’t pull the first stitch off the left needle, then do a yarn over on the right needle, THEN re-insert the right needle into the front of the initial stitch to K1 again, then pull it off of the left needle? Thus 3 stitches in that first stitch? Perhaps a video demonstration might help us all? Thank you for such a beautiful pattern. Thanks for reaching out! Unfortunately, we do not have a video tutorial for this stitch, but it sounds like you have it figured out! You will end up with three stitches from just one stitch when this increase is performed correctly. Thanks for reaching out! You have it exactly right! While we do not have the resources at present to make a video for this stitch pattern, we will certainly keep it in mind for the future! What is the pattern repeat, if one wanted to knit a cowl that wasn’t as wide? Thanks – it looks lovely! Thank you for the kind words! The pattern is cast on in multiples of 4 stitches. wanted to ask you…the pattern is a multiple of how many sts…just in case I would like it a bit smaller in perimeter? The repeat for this pattern is 4 stitches! Hi, The cowl is beautiful. I was just reading the pattern and maybe I’m missing something but on the first line where it says [k1, yo, k1] into next stitch, what do you mean by into next stitch ? OK, you lost me in Round One. What does “Knit one, yo, knit one INTO THE NEXT Stitch” mean. What am I doing into the next stitch? Looks like a fun project! This pattern looks so pretty! 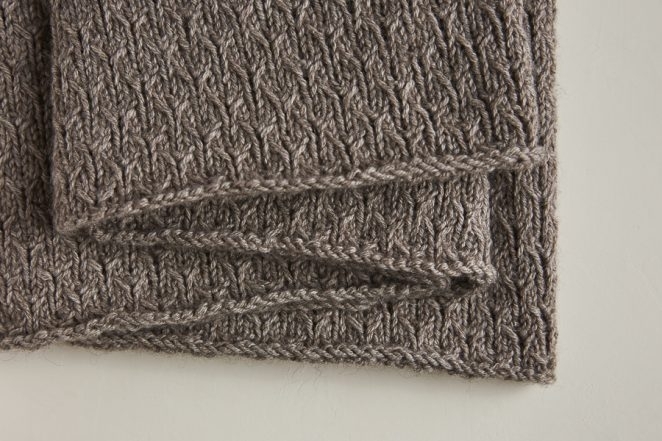 I would like to knit it flat, on straight needles, for a scarf, but I’m wondering if this would be straightforward? Is there anything I need to be aware of? Thanks for your advice! Thanks for writing in and for your request! At present this pattern is only written in the round. You can certainly take a stab at it! The main thing to note if you do give it a go is that, when working in the round, the start of row stitch changes on round three. You will need to take this into account if you try to write the pattern to be worked flat. We will certainly keep your request in mind for the future! Once again another fantastic pattern from Purl Solo. Is there any chance, when you publish, that you might include metric needle sizes too? I know its possible to convert but it would be a lovely gesture for your many fans “over the pond”. Keep these gorgeous patterns coming. Thanks for writing in and for the kind words! We will certainly keep your request in mind for the future! I, myself, generally keep a tab open in my web browser with needle sizes and yarn gauges in all of the varied systems opened to help when using patterns from abroad. Thank you again for your kind request! Hi again, I’m still confused about the directions. So do you not slip that first knit stitch off the needle, and then you yarn over , and the you knit the knit stitch and yarn over together ? Or do you do something else ? I hope that I can help! For row 1, into the first stitch you you knit 1, yarn over and knit 1. You will not be slipping the first stitch on this row. On row 2, you will be slipping the first 3 stitches purlwise with yarn in back. This will be the k1, yo, k1 that you knit into a single stitch on the first row. I hope that this clears things up and please let me know if I have misunderstood your question! Would you please consider making a video tutorial for this stitch? Thank you! Thank you for your suggestion! I will certainly pass it along. Got it ! Thank you so much ! This might clarify a few other comments … if a small edit occurs in Round 1: *[K1, yarn over (yo), k1] into next stitch, k3, repeat from * to end of round. [462 stitches] … beginning with K1 then the * and ending with K2 … the marker needs not be moved in Round 3. Round 5 remains as is. Subsequently it becomes simpler and easier to read the repeat for working in rows as well … though a selvedge stitch ought to be added. The previously slipped stitches on the RS would still be slipped on the WS. Will try to put this through the drill when yarn and needles are in hand. ‘Tis a gorgeous thorny cowl! Thanks for writing in and for your thoughts on the pattern! I’m not sure that this edit would work as the stitch alignments would change in each subsequent round. Round 2 begins with slipping 3 stitches and these would be the 3 stitches that are worked in the first stitch on round 1. Altering round require altering round 2 to make things line up correctly. We very much appreciate your thoughts on our pattern! Is it possible to make this awesome into a scarf instead? Thanks for writing in and for your request! At present this pattern is only written in the round. We will certainly keep your request in mind for the future! Hi – I’m not clear on what is happening on round 3. It seems like the marker (and BOR) is moving one stitch to the left)?? But if that’s the case why put the marker back on the RIGHT needle? Is the second slipped stitch (after replacing the marker) going from the right needle to the left needle? Thanks for writing in! You are correct! You will be moving the BOR stitch marker 1 stitch to the left. On round 3 you will remove the marker, slip the next stitch and place the marker on the right needle to make the new beginning on the round. Now you will slip the next stitch (which is now the first stitch on this round) from the left needle to the right needle. I really enjoy your patterns. However, I live in Europe. It would be great if you published the patterns with metric measurements and needle sizes also, just to make things simpler for your European audience. Thank you! Thank you for reaching out! I totally hear you- for this cowl we used a 4mm needle with a cord length of 100cm. The finished Height comes to 38cm with a circumference of 142 cm. I hope this helps! LOVE everything about this pattern! I do have a question in Round 3, slip 1, ssk, do we add the first slip 1 into the ssk, meaning only slip 1 more then knit the 2 or do we slip 2 then knit, leaving the slip 1 separate from the ssk? I hope that question makes sense! Thanks in advance for the help! Thank you for reaching out! I’m so happy to hear you are enjoying this pattern. The slip 1 is separate from the ssk, so you would slip 1 then slip slip knit. I hope this helps and please let me know if you have any further questions. Your patterns and yarns are so lovely, but why don’t you produce any of your Purl yarns in any colors with even a hint of green, green-gray, green-blue, sea green? I love nature’s shades of green and they compliment so many other colors. What do you think, will there be greens in your future? Thanks for your inspirational ideas and projects. Thanks for writing in! Each year we retire some colors to make room for new ones. Many greens have come and gone and other colors may come in the future. In Understory, we do have a lovely green, Field Mint! We will certainly keep your request in mind in the future and thank you so much for your kind comments! I’m confused about how one gets from 308 stitches to 462 stitches in round one. If one is doing one yo in every round, of repeat, (k1, yo,k1,k3) then that would only account for an extra 20 stitches in every hundred or 60 +2 extra overall. Making a total of 370 stitches rather than 462. Thanks for writing in! I think that I can clear things up! You will be working [k1, yo, k1] into 1 stitch. This will increase the 1 stitch to 3 stitches. This will add 154 stitches over the round. 1. Knit, but not pop off the left needle. I think I may have figured it out but wanted to confirm. Thanks for writing us- you got it! Unfortunately we don’t have a video for this project but I’ll be sure to pass along your request to the team! Thank you for reaching out and I’m happy you find our videos helpful! I will pass along your request. I wanted to know how the pattern goes in case we don’t want to knit in the round. I mean can we use the same stitch to make a wrap or shrug? How would this be? Thanks a lot for your time and answer! Thank you for your interest! This pattern would be beautiful as a wrap- at present this pattern is only written in the round. You can certainly take a stab at it! The main thing to note if you do give it a go is that, when working in the round, the start of row stitch changes on round three. You will need to take this into account if you try to write the pattern to be worked flat. We will certainly keep your request in mind for the future! Does thorn stitch rolls on edges (top and bottom) like stockinette stitch? The cowl looks beautiful, but rolling edges are one of my pet peeves and sometime the rolling is not obvious on a swatch. Thank you for your interest! I hear you- rolling edges are quite annoying. The sample in our shop hasn’t had any curling and remains beautiful. 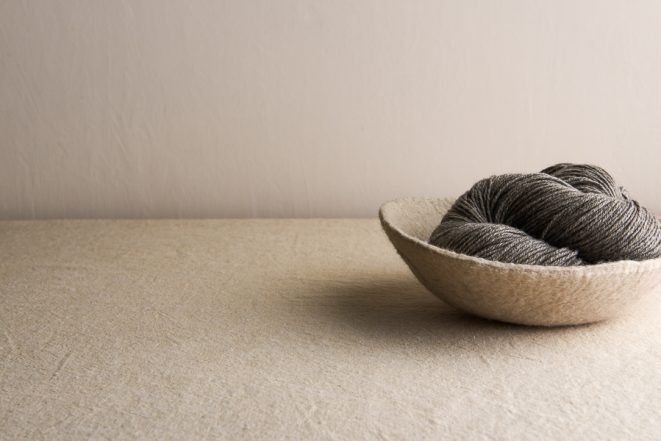 Even if you do have a bit of curling, blocking should relax the fiber enough to eliminate it. In round 2, do we slip 3 stitches together or individually, purl wise with yarn in the back? I made a graph for the thorn stitch, which I think clarifies certain things (at least for me). What would be the best way of sharing it with other knitters? Thanks for writing in! For this pattern, you can slip them individually or together. Both ways will result in the same look! Thank you so much for your kind words! I’m wondering if your gauge was very slightly off. Sometimes the gauge being off by only 1/4 inch could make a really big difference in size. It sounds like you are knitting at a larger gauge then the pattern calls for. What size needle did you go down to? The gauge required for this cowl is 22 stitches per 4 inches in thorn stitch with a size 6 needle. 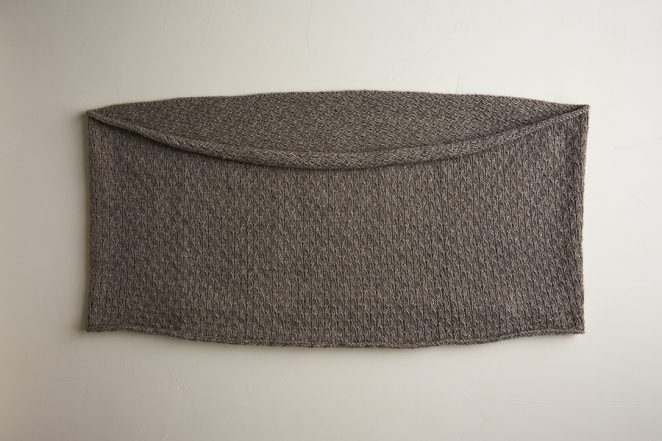 With a cast on number of 308 stitches our finished cowl circumference came to 56″. I would suggest knitting up a small gauge swatch so you know how many stitches per inch you are getting. We all knit with slightly different gauges so it is always helpful to knit a gauge swatch before starting so we don’t come across surprises half way through. If you are happy with the texture you are currently getting and just want your cowl to be smaller you can always cast on less stitches. You will still want to knit up a gauge swatch that you can use as a guide to figure out how many stitches to cast on. You will just want to make sure your cast on number is a multiple of 4. I hope this all makes sense- please let me know if I can clarify anything for you. Well I’m not sure. It definitely came out over 60inches again. Even with a six needle and being a tight knitter. My gauge was definitely different in the first try my needle was half a number larger and that added on top (conversion to metric is sometimes tricky). Now it is ok and I will not frog it again… but maybe you could give an indication in future patterns how tight you are knitting. Swatches are ok, but never really work for me, since the pattern for a piece and the pattern for swatches are different too. Thank you for this reply. I’m so happy to hear that you will not need to frog again- this is always a relief! For your future convenience I would recommend using google’s conversion tool- it is incredibly helpful and I use it all the time. Good luck with your project and let us know how it goes! Hi I really love all things you show . Thanks for writing in! At present, our patterns are only available in English. Thank you for your request! We will keep it in mind! Hi. 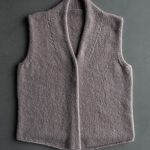 When executing the ssk, is it executed in the same manner in your video, slip one knit wise then slip one purl wise, then insert needle into both from the right needle then knit? Thanks for writing in! The ssk in the video is our preferred method! We think that by slipping one knit wise and one purl wise, we get a tidier decrease and it is what we used here! Hello~ I have read through all the comments so I hope this is not are repeat question. The 3 stitches that are in 1 stitch (K1, YO, K1) when it comes to the next round does it matter if the YO has moved position to either the first stitch or last stitch of the group? Mine never seem to stay in the middle of the group. Thank you for writing in! You should ideally keep the YO in the middle. Does it seem to be disrupting the integrity of the stitches? If the stitches do not look off or weird then I would say don’t worry about it, but If they look funky I would try to be a little more careful when knitting the (K1, YO, K1). I hope this helps and let us know if you continue to have issues and we can help you problem solves. Hey there! Very excited to try this pattern. My question is in Round 1 where is says * [k1, yo, k1] k3 then repeat from *. Do I only repeat what is in the brackets or is the k3 included in the repetition. Thank you! Thanks for writing in! For Round 1 the directions read: *Into next stitch [k1, yarn over (yo), k1], k3, repeat from * to end of round. Into a single stitch, you will k1, yo, k1 and then you will knit the next 3 stitches. You will then repeat all of this to the end of the row. This will include the stitches in the brackets knit into a single stitch. I was so looking forward to making this cowl, but then found out that the color I wanted, Willow Bark, is out of stock. Can you recommend other yarns of similar color that would work for this piece? Thank you for reaching out! 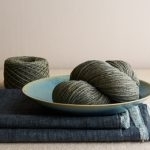 Hopefully Willow Bark will come back in stock soon, but in the mean time I would check out the colors in Brooklyn Tweed’s Arbor or Woolfolk’s Far. It seems as most questions are about Row 1. While your explanation is quite clear is there a chance to put that particular stitch in question on a video? You have so many other helpful videos out there for which I am thankful. Thank you for the suggestion! I will certainly pass it along. I finished knitting the cowl and it curls a lot. What is the best way to block it so hopefully it will stop curling. I don’t want to ruin the pattern so should I emerce it in water or steam it ? Thanks for writing in! Blocking will certainly help with curling! I would suggest wet blocking the cowl by placing the finished cowl in a basin with warm water and a leave in wool wash like Soak. Leave the item for at least 15 minutes and then squeeze out the water being sure not to wring the item. Then place the cowl on a dry towel and let it fully dry! For those wanting a scarf and not minding if the stitch pattern is pivoted … make the cowl as written (Perhaps increasing in units of 4 to get your desired length) and sewing, then cutting, a steek in it and hemming the ends? Yes, the thorns will point to the side and not up and down for a scarf … For a shawl (both width and length would need to be added) the thorns would be back to being on the vertical. Thank you for the gorgeous pattern. 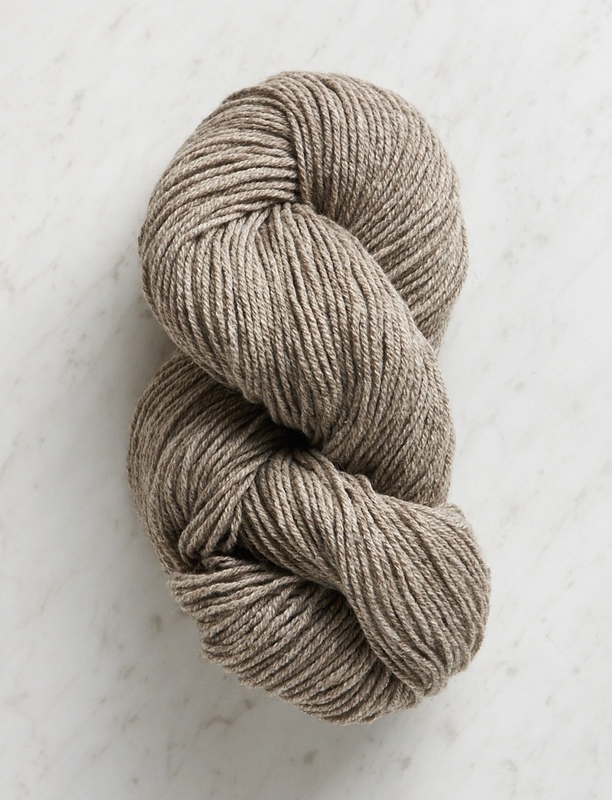 Hi, I just want to make sure that my math is correct, I want to use good wool instead of understory, so am I correct in thinking that I would only need two and a half skeins altogether because of the yardage difference? Thanks a bunch! Thank you for reaching out- you are correct! I love this pattern, but am wondering about other yarns that would be a good substitute. Would Linen Quill be an option? Hello! 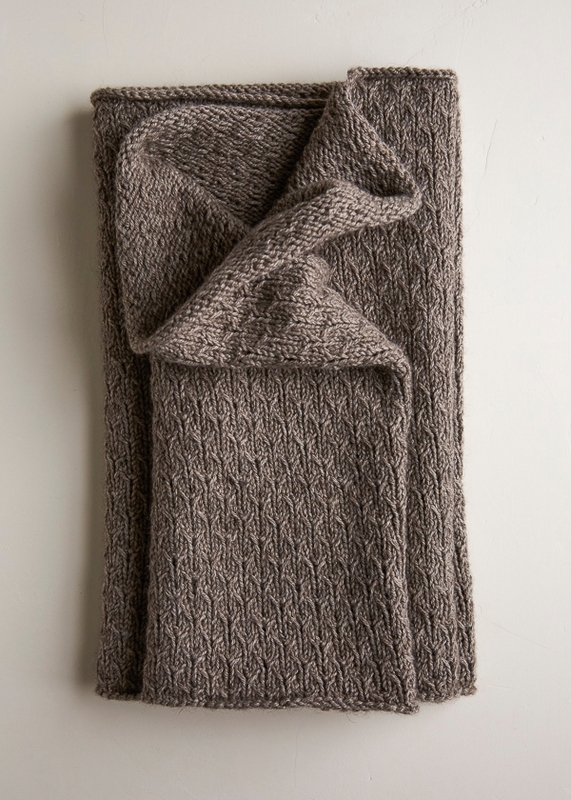 I would love to knit this up with the 750m of yarn I have but I do not have 40″ needles. I have 36″ and 48″. Would it be possible to use either of these lengths or would there be a way to adjust the pattern? Thanks! Thank you for reaching out! I think you will be totally fine using your 36″ circular needles for this project. Your stitches will just be slightly more scrunched up, but this shouldn’t be to much of an issue. Hello. I just finished making this beautiful cowl! I used 100% Merino instead of the Understory and the fabric keeps curling up on both edges. Any suggestions to prevent this curling? Thank you for reaching out! I would suggest wet blocking the cowl by placing the finished cowl in a basin with warm water and a leave in wool wash like Soak. Leave the item for at least 15 minutes and then squeeze out the water being sure not to wring the item. Then place the cowl on a dry towel and let it fully dry! Hi! So if I get 3 skeins of Understory and cast on 288 stitches do you think the cowl would still have nice drape around an average-sized neck? And would that still be enough yarn to achieve a height of 15 inches for the cowl? Many thanks for the gorgeous pattern. Thank you for reaching out! Yes, I think you will still get a lovely drape. As far as height goes it is hard to say, you will certainly get closer to the 15″ I would say you will likely get to 14″, but this is an approximation. The Thorn Stitch Cowl pattern is simply beautiful, however, it is too much fabric for me because the height is 15 inches with a cast on of 308 stitches. 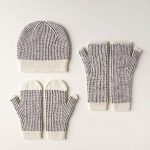 I would like the height to be shorter–perhaps 9 or 10 inches and still fit comfortably around my neck, and I was wondering what my cast on number of stitches should be. Is there a particular way to figure this out? Thank you for such beautiful patterns! Thanks for reaching out! 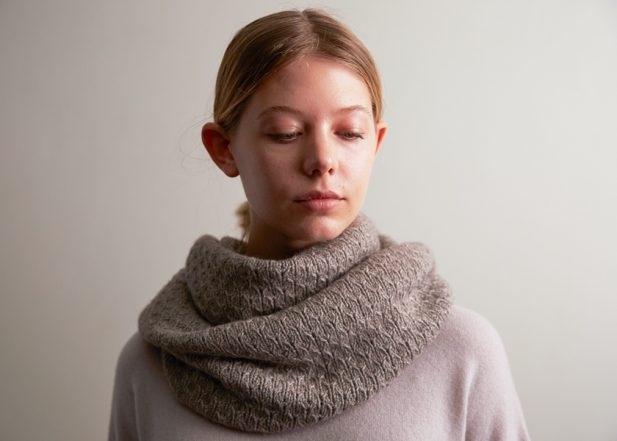 Since the cast on is the length of the cowl, if you wish to keep the length the same, you can cast on the same number of stitches and simply stop knitting when you reach your desired height. What does “in the reverse order” mean? Thanks for anyone’s help, and ago Purl Soho for letting people riff on their patterns. 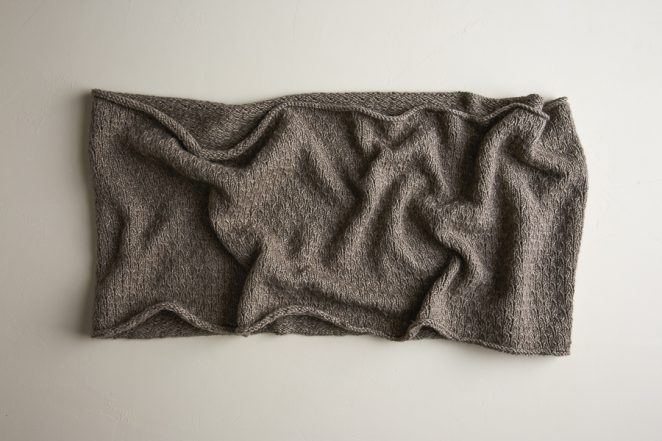 If I want to knit this as a shawl, what is th multiple of stitches? I would like the shawl 18″ by 80″. When we work the even number rows backwards, do we turn or slide the stitches first? Last question, any guess on the yardage I’ll need? I LOVE your patterns with the tutorials. It really makes the pattern friendlier for us newer knitters! Thank you for reaching out and for your kind words! While we do not have a version of this stitch knit flat, the stitch multiple for working it in the round is just a multiple of 4.